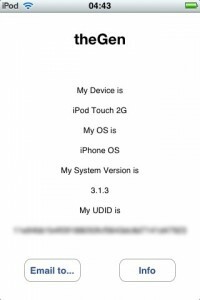 Written ‘back in the day’ – when obtaining the UDID of an iOS device was a trauma, and when getting ‘tricky’ details of users devices when they said ‘It crashes when I press X’ proved a trial – theGen was born. A simple app for the iPhone and iPod Touch. It allows you to send details on your device’s OS version, hardware type, and the all important UDID for developers to do ad hoc builds. Ad Hoc builds allow developers to get people to Beta test their products, and are an important stage in the iOS App development process. 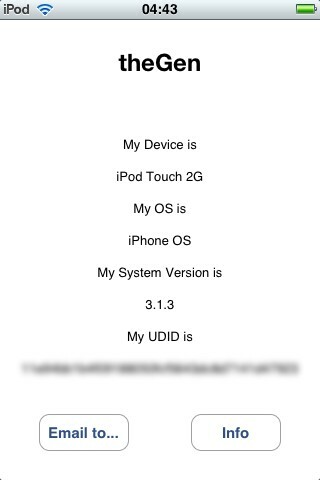 Getting UDID’s is straightforward – for someone who knows what they are doing, but most people aren’t developers! Talking them through getting the necessaries can be a painstaking, and time consuming business – especially with typo’s in emails! theGen gets past all that, by pulling the details direct from the device, and supplying them in an email to whoever you choose to send them to!